In my opinion, fall is hands down the best season of them all. 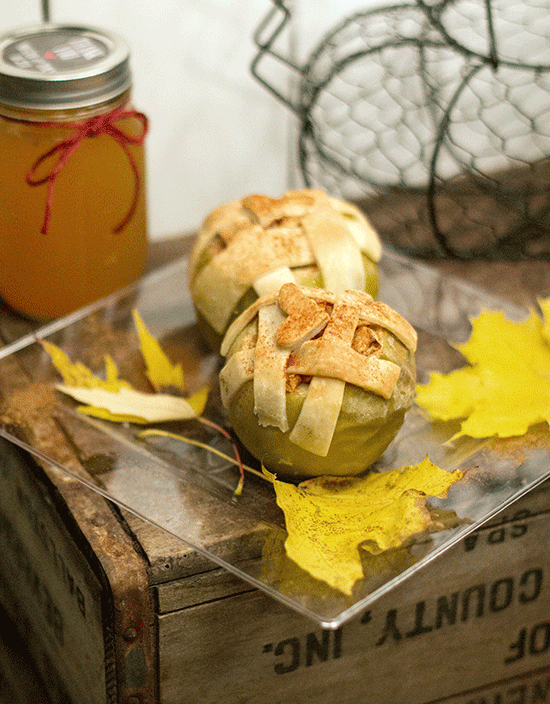 Its not too hot or too cold, so why not kick back and relax with an apple pie baked in none other than…are you ready for this one…An apple!! It might not look pretty, but trust me it is amazing. When I first saw these beauties the apple was brightly green and overly filled, very appealing. Don’t let that perfectly Photoshop picture fool you, its not real life and nothing looks like that. After I made them, my mouth was screaming for joy, probably because I couldn’t wait and burned my mouth but it tasted like a fall day exploded in my mouth and I wasn’t mad about it. This is also best served with lots of vanilla ice cream. Preheat oven to 375 degrees and begin to cut off the tops off the apples and discard. Scoop out the inside of each apple, discarding the core and keeping the good stuff for the filling in a separate bowl. Be careful and try not to puncture the peel. Chop the filling into smaller pieces then begin to squeeze the lemon juice all over, this will help it hold color and bring out the natural flavors. Start mixing the cinnamon and both sugars together with the scooped out apples. Unroll your piecrust and slice into ¼ inch strips for the lattice pattern, with leftover dough use a heart shaped cookie cutter or any shape you prefer. Cover the top of the filled apples with the lattice pattern or any you chose, brush top with melted butter onto crust and sprinkles with sugar. Place apples in a baking dish and add just enough water to cover the bottom of the dish. Cover with foil and bake for 25 minutes, remove foil and bake for another 30 minutes or until crust is golden brown. Serve with a heaping side of vanilla ice cream or glass of milk, your guest and family members will rave about it. ENJOY!